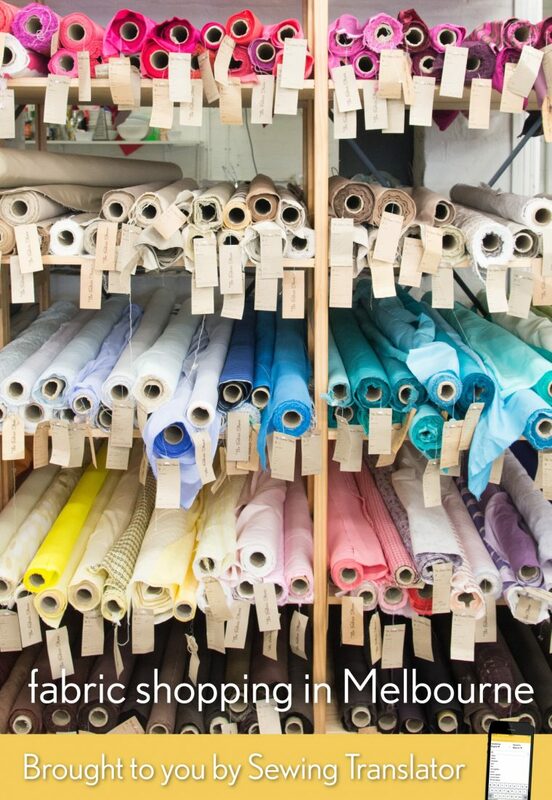 Today we have the third installment in our series of posts about fabric shopping around the world. Liesl kicked off the series with her Fabric Shopping in Madrid post, and last time I brought you a fabric shopping guide for Minneapolis. 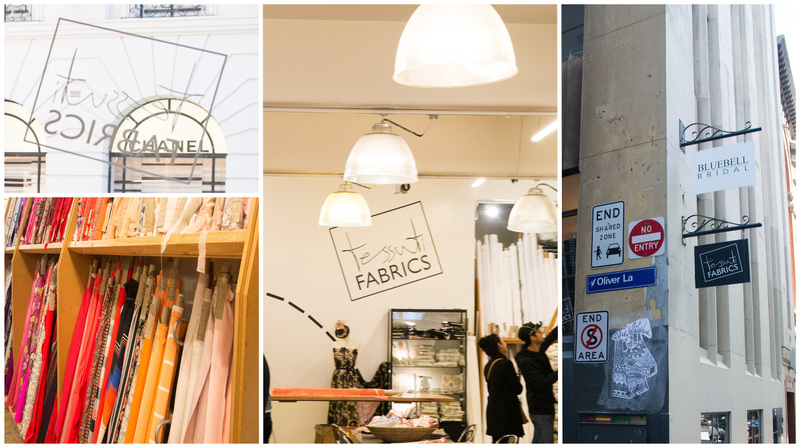 Today Shelley is bringing you a fabric shopping guide for Melbourne. Our fabric shopping posts are a great time to remind you of Sewing Translator, which many of you have contributed to and use. We hope it will be useful to you as well in your travels. Sewing Translator is now available in 14 different languages, and if you have an iPhone or iPad you can download it to use the native iOS app off-line as well. You can find Sewing Translator in the Apple app store, and it’s free. Hello and welcome to my city, Melbourne, Australia. You’ll want to get up early as we have a big day ahead of us! Melbourne is a city of just under four million people which covers an area of almost 10,000 square kilometres. We care deeply about certain things, such as football teams and favourite coffee shops, and are quite tribal in how attached we are to our own little patches of this big city. Ask a Melburnian where to shop for fabric and I bet they’ll name a shop within a few kilometres of their home. I couldn’t possibly go to every fabric shop in Melbourne but I visited a good number of my regular haunts and I’m sure you could find whatever fabric or notions you wanted amongst all of these. Let’s start with a trip into the Central Business District, or CBD. 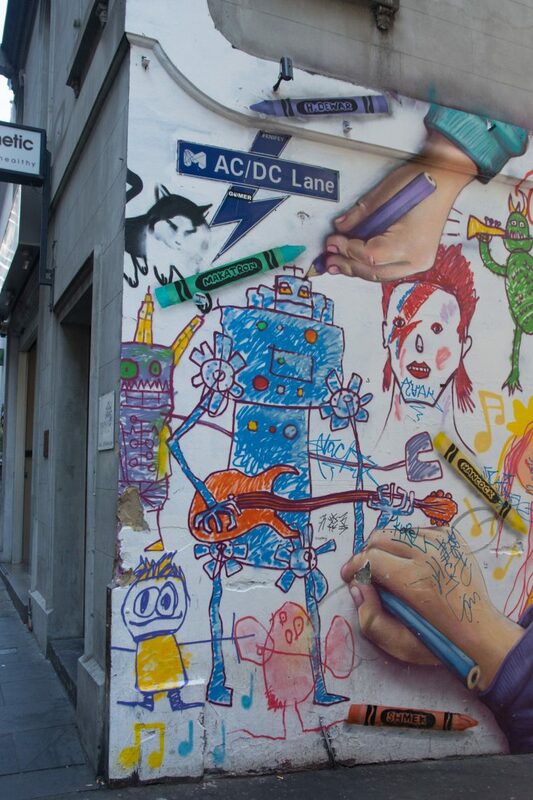 The inner city of Melbourne is known for its small laneways, street art, coffee, restaurants and architecture. Sadly, not so much anymore for its fabric stores but there are some exceptions that make a trip into town worthwhile. First up is the Nicholas Building. 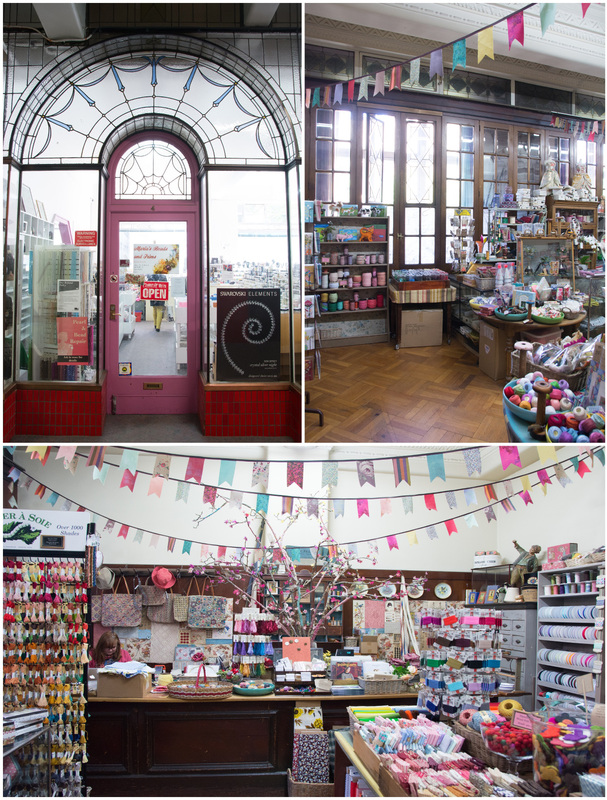 The Nicholas Building is a beautiful building which houses a very eclectic mix of small artisan craft stores and makers. Up until just a few years ago the elevators were operated by hand and the building itself is worth a visit. On the first floor is Maria’s Beads and Trims, not a fabric shop I know, but a great place to buy all sorts of tiny sparkly things to sew onto little girl’s dresses. On the second floor is L’Uccello, a delightful shop full of beautiful cotton fabrics, embroidery threads, ribbons, wool felt, vintage buttons and all sorts of gorgeous things. This is a shop that never fails to inspire me to add embellishments to everything! The second floor also houses Kimono House: a shop selling Japanese fabrics, kimono fabrics and everything you need for sashiko embroidery. Previously, the second floor of the Nicholas Building was also home to Buttonmania. This store has now moved out of the city but is still worth a visit as buying buttons by consultation is something that everyone should get to experience. No matter how impossible I thought it would be, they’ve never failed to find me the perfect buttons for my projects. Walking up Flinders Lane in the city, we come to Tessuti fabrics. 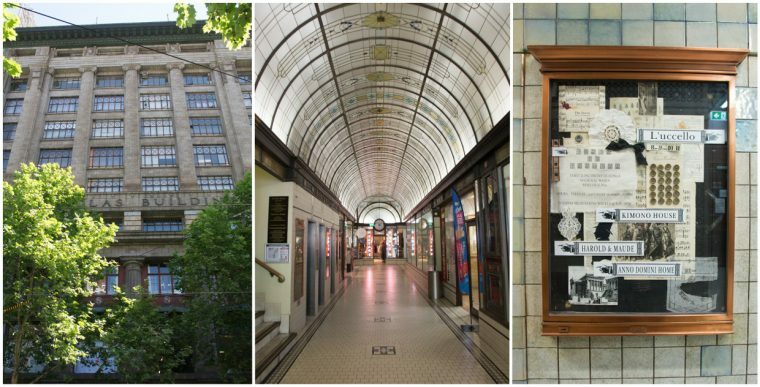 Tessuti is right in the middle of the old rag trade strip of Melbourne and is now surrounded by high end couture retail shops. They sell divine fabrics at the upper end of the price range. But if you feel like you’re overspending on fancy wool boucle for a jacket, you can always pop across the road and see that a Chanel version would cost ten times as much. Tessuti also have their own patterns and in store you can usually try on various samples. An old stalwart of the city was the Job Warehouse. After decades of seeing the same dusty bolts of fabric and dead flies in the window, I had never gone in, and then it closed down. I was excited to learn that the vintage fabrics are being sold off via the Crossley Job Lots warehouse. Worth a look one day I think…. Heading north out of the city, let’s go to Sydney Rd Brunswick for some serious bargain fabric shopping. A cluster of four fabric shops in one block of Sydney rd can have you sorted with everything from wool suitings, ITY knits, laces and shiny “ethnic” fabrics of unknown fibre type. These shops can yield some absolute treasures and I have sometimes found fabrics for two or three dollars a metre which have looked, and felt, much fancier than their price tag would suggest. An area with a strong cultural connection to the Mediterranean, you’ll be sure to get great coffee and baklava to go with your cheap fabric purchases. 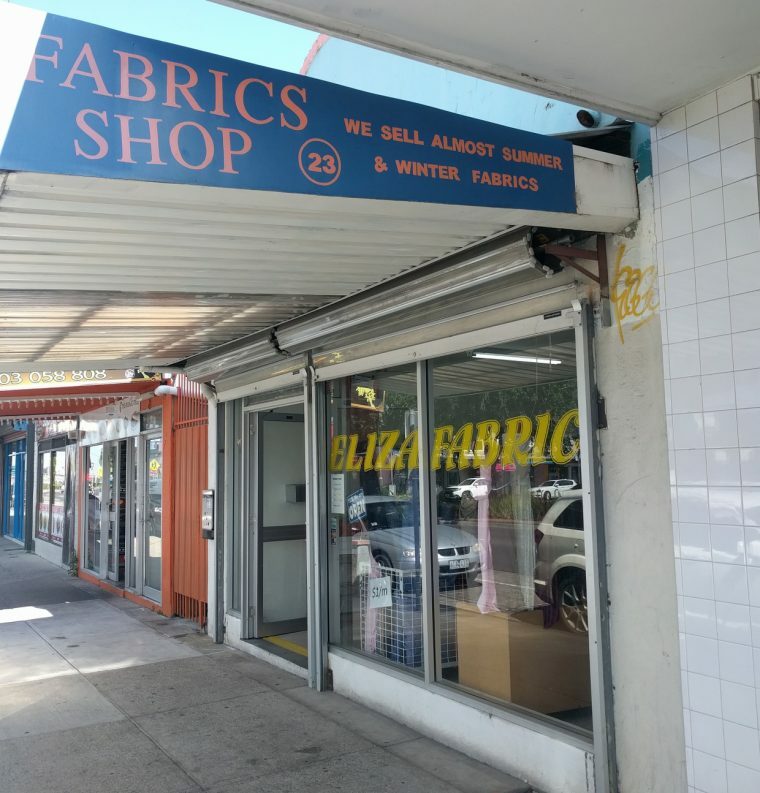 Let’s take a little diversion to a similar type of shop with a huge range and visit Eliza’s Fabrics in the western suburb of Sunshine. I’ve no idea what is meant by the sign that says they sell “almost summer” fabrics, but they do seem to sell almost everything. Don’t be put off by the shiny, nasty stuff at the front of the shop. Once you get further in you’ll find linens, denims and wools at very cheap prices as well as a huge range of lingerie elastics, trims and ribbons. The only thing I’ve never been able to get from Eliza’s is a smile from the lady who runs the shop. From here we’ll head back East and visit Rathdowne fabrics. 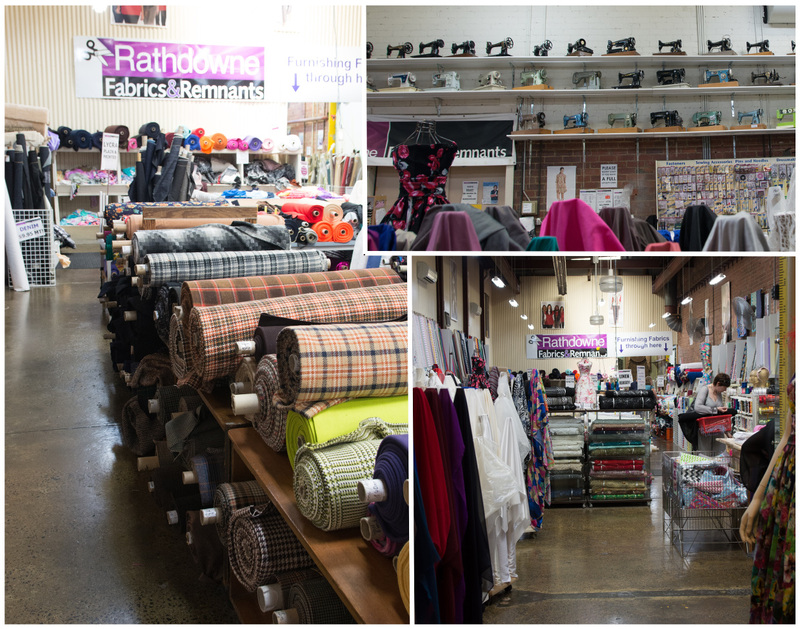 Rathdowne fabrics is my go to place for knit fabrics. They have a huge range of plain and printed knits and when you need a certain colour and certain weight of knit you’re sure to find it here. But they also have a great range of cottons, denims, wools, formal fabrics and even furnishing fabrics in the back room. Further across to the East we come to GJ’s Discount Fabrics in Fairfield. 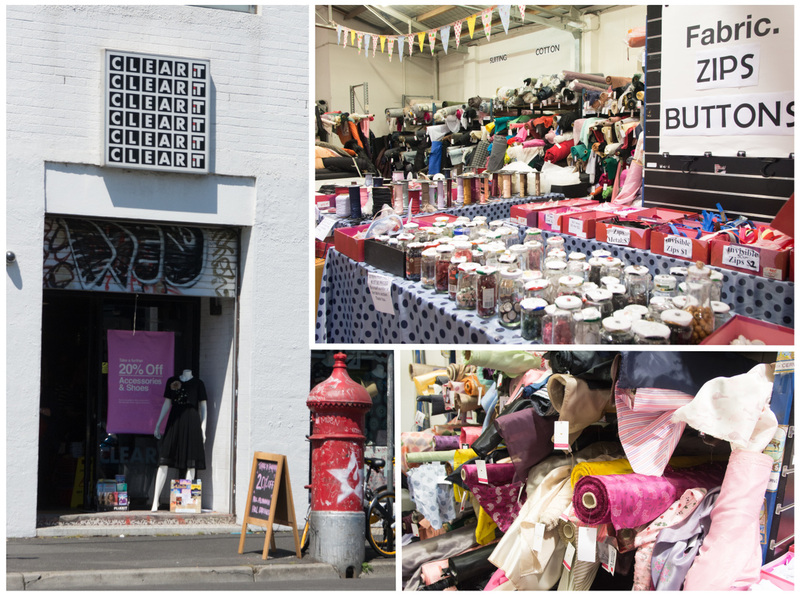 GJ’s is Melbourne’s mecca for quilting cottons. They have an enormous, spacious store with all those perfect card bolts of cottons and lots of delightful sample quilts and toys. They sell some apparel fabrics but their other main drawcard is the huge range of spandex knits. I recently learned that saying you’re sewing a costume earns you a 10% discount. The way my kids dress themselves I could argue that every outfit is a costume! Heading a bit further east into the “leafy suburbs” we come to The Cloth Shop in Ivanhoe. 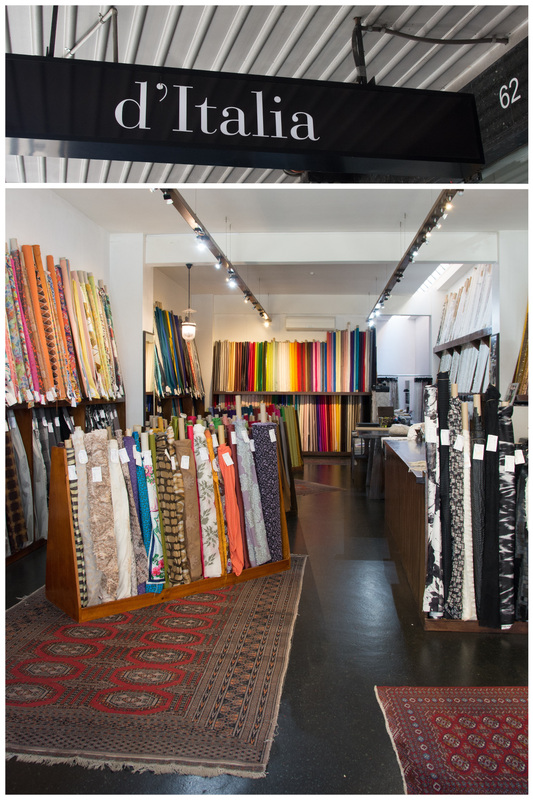 This lovely shop is one of Melbourne’s favourites and always has a beautiful selection of fresh, modern fabrics. The prices are sensible and the shop staff are excellent at helping with pattern and fabric selections. They often have samples of various popular patterns made up in store so you can get a feel for the fabrics or style of garment. From here it’s only a short trip to one of Darn Cheap Fabric’s three stores. Darn Cheap have a big range of apparel fabrics and lots of trims. The stock can vary between the stores but amusingly their fabrics sometimes reach peak popularity and suddenly everyone is sewing with “that fabric” from Darn Cheap. Going back in towards the city we head to the inner north east and the quintessential suburbs of Collingwood and Fitzroy. We’re in hipster central territory here and your coffee will never taste better, nor will it ever be made by a younger man with a more impressive beard. One of my all-time favourite haunts is the Aladdin’s cave of buttons and notions that is Jimmy’s Buttons. A tiny button-studded doorway set back from a quiet street, a narrow tunnel entrance of collapsing bolts of fabric and then, all that treasure…. Ribbons, elastic, trims, buttons, bag hardware, zippers. It’s all here and if you can’t find exactly what you’re after, Jimmy will always offer to dye something to your specifications. Neatness freaks may find this shop too distressing to enter, but trust me, it is a magic cave of sewing notions. In stark contrast we now visit the perfect, orderly and light filled space of The Fabric Store. A business with its origins in New Zealand, The Fabric Store has multiple shops in Australia and also now in Los Angeles. They’re possibly best known for their merino wools, from thin jerseys through to fleece knits and coatings. However, this is also the place to go for linen, Liberty apparel fabrics and lots of luxurious dressmaking fabrics. They also have a good range of leathers for bag making. Put your name on the mailing list and come back when they have their big sales. Next door to The Fabric Store is a place you’d never think to enter for fabric shopping: ClearIt. This is an outlet store for samples and seconds for a couple of fast fashion labels. Head upstairs and there is a good-sized area of fabrics. 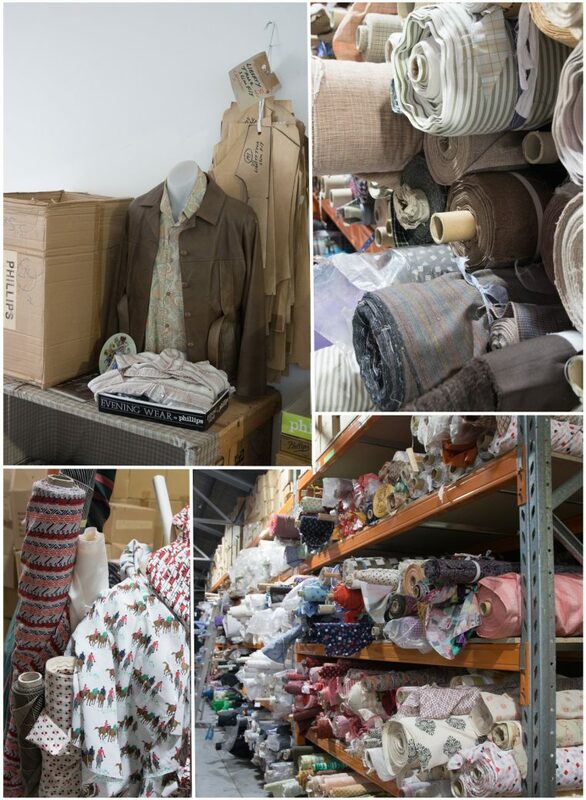 These are mostly designer bolt ends or surplus stock and it’s an excellent source of coat and dress lining fabrics. The selection of apparel fabrics is varied and changes fairly regularly so it’s always worth a visit. Anyone living South of the Yarra river is probably now screaming about all the places I’ve neglected to mention. Let’s head that way with the intention of visiting the Phillips Shirts factory in Malvern. Phillips Shirts used to be in the heart of the CBD with a huge backroom of fabrics that was opened to the public on special occasions. Since moving out of the city the fabric stash has reduced somewhat but the bonus is that now, a knock on the door on any weekday, can get you access to all that shirting fabric. Cotton shirtings dominate but there are also plenty of linens, some Liberty fabrics and a small selection of knits. Once you’ve picked your shirt fabric there is another nearby button shop in The Button Shop and then just up the street from there is d’Italia, a shop stocked with beautiful imported dressmaking fabrics. Are you exhausted yet? I am. The list of places to visit continues and I haven’t touched on the specialty stores (bridal fabrics, dancewear, leather etc) at all. 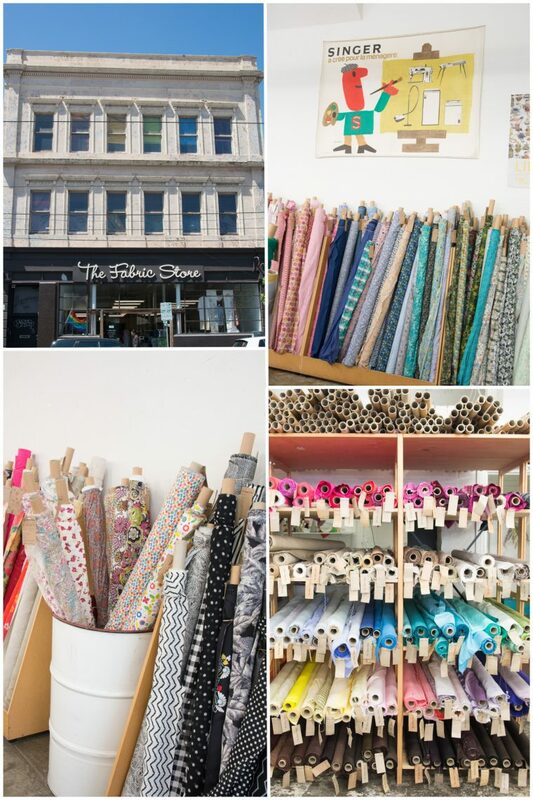 What I love about Melbourne is that every part of Melbourne has its own flavour and that influences the fabric stores as well. My own suburb has seen waves of migration from Italy post WWII, from Vietnam in the 1980s and from South Sudan more recently. That means I can buy Vlisco African Wax prints in one shop, have a great coffee and cannoli next door, and then head down the street to my favourite shop that sells overlocker threads and ping pong tables. 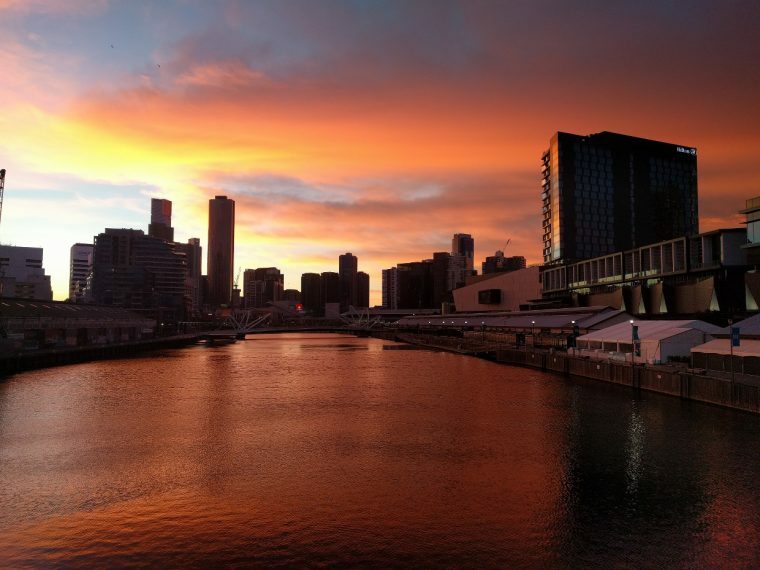 Perfectly sums up our beautiful Melbourne! GJs is my favourite, love waking through their store with coffee in hand of course. The staff are lovely too. So true. As babies my kids loved their toybox. Now the staff still ask to see photos of them in their handmade clothes! Great roundup Shelley – love this city to bits! Am I allowed to say myself how great this looks? 🙂 Given unlimited free time and fabric budget and I think we could easily have chapters 2 and 3 for Melbourne. There are so many more places to see…. Thank you. Just got back into sewing. Recently moved within two hours travel from Melbourne instead nine. Left many years ago. It has changed so much I had no idea where to find decent fabric shops. Great article. I now have lots of places to explore:). That’s great Judy, welcome back! Dang, how am I going to get a trip to Melbourne? Wow, I’m exhausted, too! I can’t believe how many fabric and trimming stores there are, and so close together! Thank you for sharing your beautiful city. Oh this makes me so homesick for Melbourne! The city always welcomed you back for a visit! 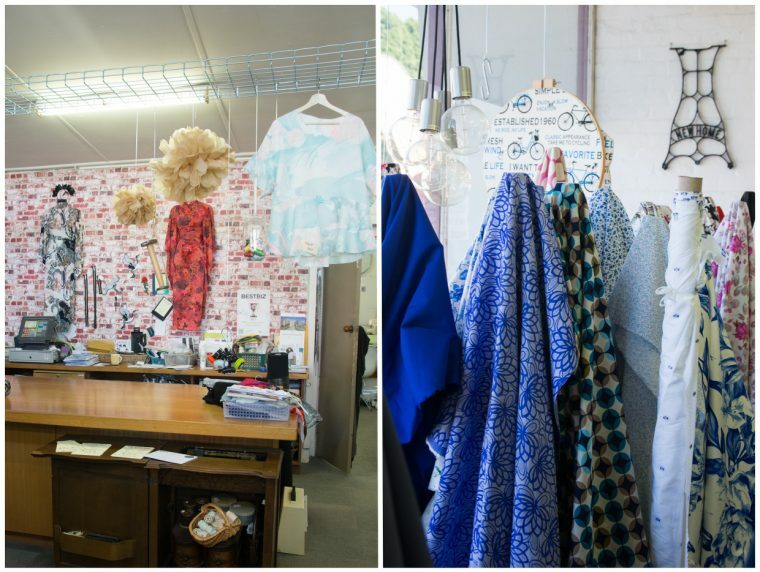 Thanks for this post–I’m in Geelong and feel a fabric road trip coming on! Absolutely! 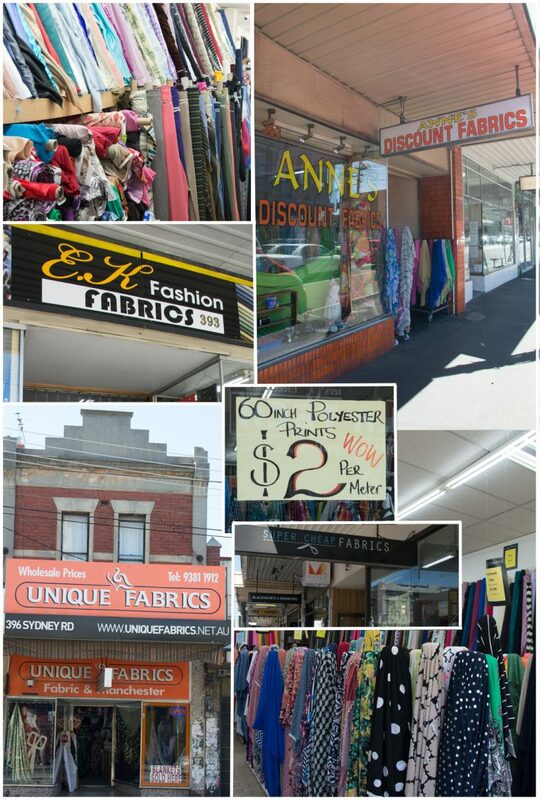 I’m sad I never got to the legendary Joy’s fabric store in Geelong before it closed. Thanks Trish. I was nervous the locals would only notice the ones I’d missed getting to! Where can l buy leather for sewing but also for leatherworks? Hi , Leffler leather supplies . Used to be in South Melbourne but now I think Footscray . NSW Leather in Collingwood, just around the corner from Jimmy Buttons. Very entertaining read, Shelley. I would love to visit that shirting shop. My fabric shop is Spotlight, 1 hour away and I haven’t found any shirting fabric suitable for men there yet! Ah yes. I left out the “big box stores” like Spotlight and Lincraft. But I have to say Spotlight have really lifted their game and often have some great fabrics. Another good one for shirtings is Davisha textiles. They would probably do phone orders and have great photos on their Instagram feed. Thank you, thank you. I’m of to Melbourne on holidays in 2 weeks. My husband doesn’t know what he is in for – well actually he probably does. He’ll enjoy the good coffee. Excellent! I hope you have a lovely visit. Wow, shopping in Melbourne looks amazing! Thanks so much, Shelley. What a great tour of Melbourne. I already frequent (we, okay, haunt) the Brunswick, City and Collingwood stores, as I must rely on public transport, but will talk someone into taking me to the other side of the Yarra. Thanks for the blog, I alays enjoy reading it. Thanks Denise. If you’re using public transport then I’d strongly recommend a visit to Eliza’s. It’s right near the Sunshine train station and there’s a lovely Polish corner cafe opposite that does great cakes for morning tea! A few not mentioned are Tyler’s in Richmond ( wholesalers) to most bridal dhops ! Fantastic bridal and evening fabric . Then Franke Stuart Hawthorn run by the same family for over 50 years . If you have time in Auburn Rd is the Silk Trader . 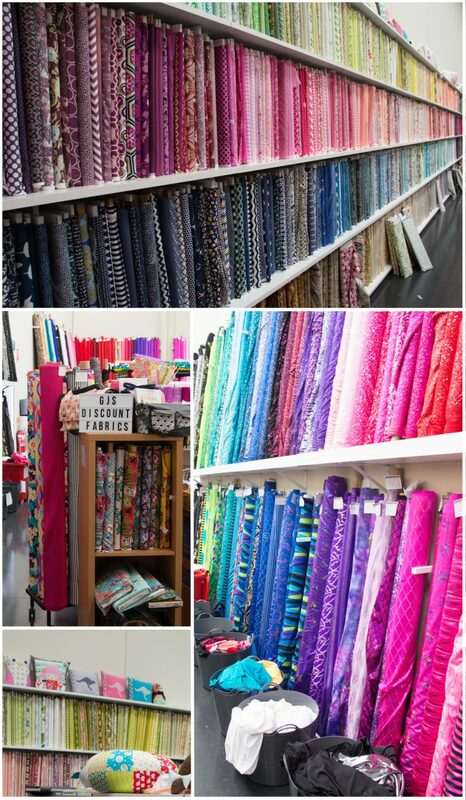 And then in Brisbane Alla Moda fabrics supply of fabrics is exquisite. Thanks for this article . .. happy stitching !!! This is brilliant, went to Melbourne for the Dior last weekend and I wish I had had this post. Actually I am not buying this year but stash busting so on the 1st of January 2018 I will jet down to a city I now love even more. Thank you so much. Ha ha, Tania I’m also on a stash diet so writing this post was torture! I’ll confess to some cute ruffle swimwear fabric from GJs and some linen from Phillips, but I think I was quite restrained! Anyone know where to get African wax print fabrics in melbourne? Yep, an online store called Brave Fabrics. Otherwise there is a hairdresser/chemist in Footscray that also sells wax prints. And I saw some bolts of Vlisco-esque (possibly knock offs?) in the window of Super Cheap on Sydney Rd. Wow. I live 2 hours from Canberra and visit Melbourne occasionally. With this great information a trip is imminent combined with the 70 years of Dior at the NGV. Thank you. Thank you so much, shelley. As you say, people are rather parochial about where they shop, understandably; so, it’s wonderful to have such a useful overview. I love L’ucello, too. Awesome post – I’m a regular at many of these shops. I love that there are so many decent fabric shops in Melbourne. Anyone here knows where to buy bamboo fabric in bulk? It will be used for screen-printed design bandanna. I am looking for scrap fabric donation in Melbourne as we are running a Scrunchie drive to raise funds for the homeless this winter. Please let me know if anyone is able to assist. Hi Showna, I am sure there are plenty of patchworkers that could help. Maybe post onto the patchwork pages as well as contacting spotlight directly.